President Kersti Kaljulaid’s meeting with her Russian counterpart Vladimir Putin, set to take place on April 18, is shrouded in mystery. It remains unclear why such a high-level meeting is planned. Several experts have criticized secrecy surrounding the meeting’s agenda, as well as the fact the visit is being planned during a time Estonia is between governments. While Interfax has communicated that the Kremlin is making preparations for the visit, the Office of the President had not received formal confirmation by yesterday evening. “There is no formal reply. There is still time, let us stay calm,” the president’s PR chief Taavi Linnamäe said. Topics for the meeting largely remain a matter of speculation, but Taavi Linnamäe said the president’s willingness to shed light on them is not the issue here. “I believe that it is a little premature to comment on the topics of the meeting in a situation where we have no certainty it will even take place,” Linnamäe said, pointing to lack of a formal reply. Linnamäe eventually said that should the meeting go ahead, topics will include mutual relations and international developments important for Estonia. “International security architecture, aggression in Ukraine and the partial occupation of Georgia,” Linnamäe listed and added that the president will stick to the values and foreign policy course Estonia has maintained for nearly 30 years now. Chairman of the foreign affairs committee of the outgoing parliament Marko Mihkelson criticized the veil of secrecy surrounding the meeting. “The visit is shrouded in more mystery than it should be,” Mihkelson said. He added that a presidential visit is not just popping next door but would require thorough diplomatic and political preparation, considering the low tide in Estonia-Russia relations. “If there has been one, the foreign affairs committee has been left out of the loop entirely,” Mihkelson said. 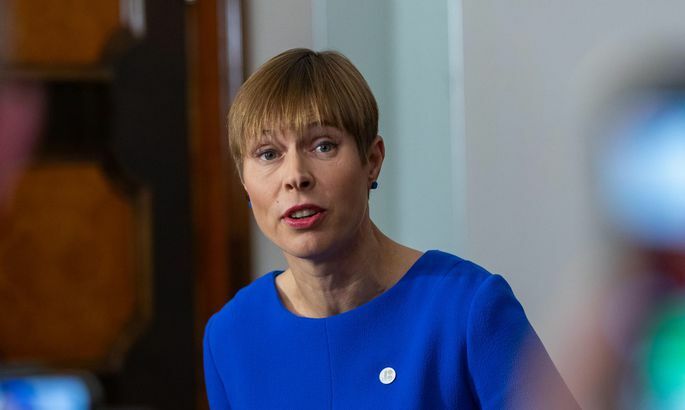 The politician believes Kaljulaid should explain how she perceives Estonia-Russia relations at this time and what she would like to discuss with Putin. “Society deserves opens cards in this matter,” he said. Foreign policy expert Karmo Tüür is also critical of the president for withholding information. “The Office of the President has created uncertainty out of thin air. There is an information vacuum that should be filled post haste, before someone else gets to fill it with rumors or malicious information,” Tüür explained. Director of the Estonian Foreign Policy Institute Kristi Raik is far less pessimistic regarding the meeting. Raik said that while no grand goals should be set, the meeting is not to be feared either. “Communicating with Russia on the diplomatic level is necessary and should be seen as a normal part of diplomatic work,” she explained. Raik believes that Kaljulaid’s visit should not be interpreted as surrender or complaisance. “Estonia needs to know Russia, and mutual communication is beneficial in this regard,” she said. Experienced diplomat, foreign policy and security expert Kalev Stoicescu said that receiving the Estonian president definitely benefits the Kremlin as welcome change to hosting the usual suspects so to speak. “It does not mean Estonia plans to become “Finlandized” or follow in the footsteps of prime ministers Orban, Fico or Kurz,” he said. Stoicescu feels that both sides are interested in getting a feel for the other and demonstrate good will. He added that hopes to achieve something are slim. President Kaljulaid told Eesti Päevaleht in October of 2017 that she would only visit Russia if the border agreement was ratified. While the process has been put on hold, Stoicescu believes it could be the most important topic of the meeting. He speculated that Putin could promise the State Duma will move forward with the agreement if the Riigikogu takes the first step and avoids a repeat of the scenario in 2005 when the Estonian act to ratify the agreement was complemented with a unilateral declaration at the last minute that caused Russia to withdraw its signature. “President Putin has enough power to keep his promise. In Estonia, the fate of the border agreement rests with the new Riigikogu. It is likely that the incoming coalition will not find consensus in this matter as two of the three participants regard the agreement as unconstitutional,” the expert explained. Stoicescu said that Putin could present Kaljulaid with a poison apple that will prove a serious touchstone for the likely government coalition and the Riigikogu.